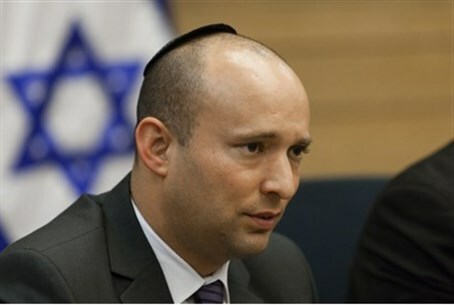 Economics Minister Naftali Bennett reacted strongly Tuesday to a top headline in the popular Walla! news website that accused him of traveling the world at taxpayers' expense. "I landed a few minutes ago from a working visit to Indonesia and Australia," he wrote on Facebook. "And I see a top (!) headline in Walla, where they say that 'Bennett traveled the world at the taxpayers' expense, more than any other minister.'" "Yeah. That makes sense. That is why I joined politics. In order to 'travel the world at your expense.' Because I suffer from a lack of money, after selling my company for 145 million dollars, and I couldn't pay for it myself." Bennett addresses the editors at Walla! and explains: "In Indonesia, the largest Muslim country in the world, where no Israeli minister has visited for 13 years, I met dozens of ministers of trade and economics from the world over, under the auspices of the WTO. "We advanced trade agreements with surprising countries that I cannot yet make public. We advanced cooperation agreements in research and development vis-à-vis countries in the East, as I promised to do. My bodyguards almost collapsed from the murderous meeting schedule, and told me they do not recall such an intensive visit. "And in the end, the WTO's historic trade agreement was signed. No, that was not thanks to us, but we were involved, too. "I spoke in front of 157 of the world's economics ministers (!! ), including those of Arab countries that we have no diplomatic ties with." "In Australia (straight from the airport) I met Prime Minister Tony Abbott, whose country is a member of the UN Security Council, and heads the Committee on Sanctions against Iran (!). "This was a very important meeting, because he has not yet met an Israeli minister since he was elected, and Australia has great influence in the next phase, six months from now, when the interim period ends." Bennett then summed up the rest of his trip, which included meetings with Australian businessmen and investors, and six talks before Jewish communities, at synagogues and various conferences. In India and China, too, he said, he worked to open the local markets to Israeli companies. "There are more attractive places than Mumbai and Delhi, and even Beijing," he noted. "In summation, my brothers and sisters – I will continue to work very hard for you, even if the media criticizes me for my 'travels' at your expense. "I promise to do what is good for the nation of Israel, and not to be influenced by newspaper headlines. I will not let journalists keep me from working for you. Forget about it. "I just got home from the airport and baruch Hashem, I managed to see my four children. I am going to shower now, because I have a work day ahead of me."